A rodent-eating snake and a hamster have developed an unusual bond at a zoo in the Japanese capital, Tokyo. Their relationship began in October last year, when zookeepers presented the hamster to the snake as a meal. The rat snake, however, refused to eat the rodent. The two now share a cage, and the hamster sometimes falls asleep sitting on top of his natural foe. "I have never seen anything like it," a zookeeper at the Mutsugoro Okoku zoo told the Associated Press News agency. 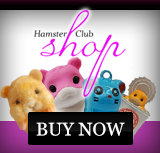 The hamster was initially offered to Aochan, the two-year-old rat snake, because it was refusing to eat frozen mice. 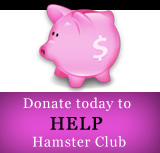 As a joke, the zookeeper said they named the hamster Gohan - the Japanese word for meal. "I don't think there's any danger. Aochan seems to enjoy Gohan's company very much," said zookeeper Kazuya Yamamoto. 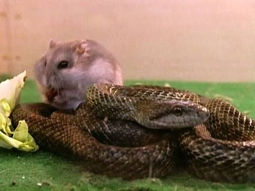 The apparent friendship between the snake and hamster is one of many reported bonds spanning the divide between predator and prey. Never try to introduce a snake and a hamster, because the snake will eat the hamster.